Between 1825 and 1843, about 80 water buffalo were brought to Melville Island and the Cobourg Peninsula (now in the Northern Territory) as a meat supply. When these settlements were abandoned in the mid 1900s, the buffalo soon colonized the swamps and freshwater springs of this part of the 'Top End'. 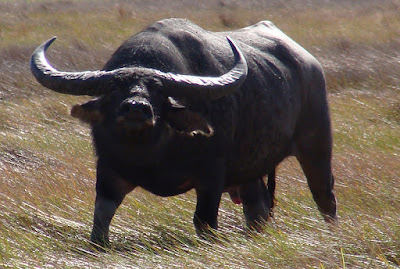 Despite harvesting them for meat, hides and as hunters’ trophies, feral buffalo spread across the northern floodplains. There are two types; the river type from western Asia, with curled horns, and the swamp type from eastern Asia, with swept back horns. 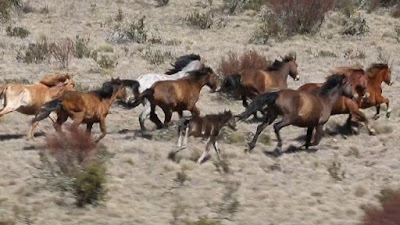 Prior to extensive culling in the 1980s, the population was estimated at around 350 000. Numbers dropped dramatically as a result of the campaign but have since recovered to an estimated 150 000 animals across northern Australia in 2008. The feral buffalo grossly altered the character of the northern floodplains. With its wallows, trails, dung, trampling and disturbance, it caused soil erosion, channelling of flood waters, increased intrusion of salt water into freshwater habitats and destruction of wetland vegetation. They can carry important diseases of cattle, particularly tuberculosis and brucellosis. A number of small scale industries involving the buffaloes remaining have developed eg.meat for human consumption (local and international), pet meat, hides, horns, animals for live export and game for hunters. permission to maintain a domesticated herd. Farming of re-domesticated herds is also increasing. Goats came to Australia with the first fleet in 1788.
emergency food. Cashmere goats were brought into South Australia in 1837. In the 1860s, angora and cashmere goats were imported from Asia to start a goat fibre industry. Some herds were set free when the industry collapsed in the 1920s. More recently, goats have been used to keep plantation forests and inland pastoral land free of weeds. The current feral goat population in Australia represents a mixture of all these origins. 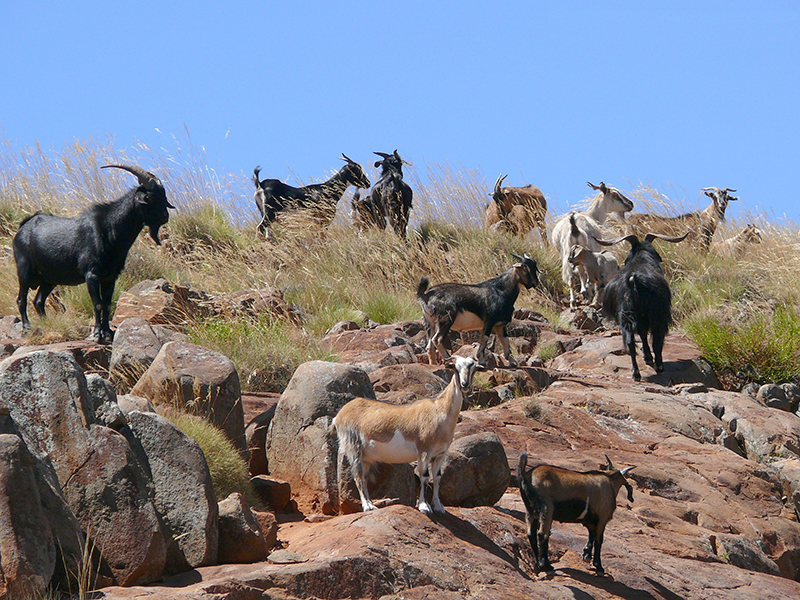 There are at least 2.6 million feral goats but numbers fluctuate enormously with drought, management programs and high fertility so it is very difficult to accurately assess numbers. They are considered a significant agricultural and environmental pest. They have been estimated to cause losses to livestock farming of $25 million per year. The goats also negatively affect conservation values and biological diversity by damaging the vegetation and competing with native animals. pest, they also have some commercial value and are used as a game species by recreational hunters. We don't have wild goats around here. Well, not the four legged variety anyway. The first recorded release of pigs in Australia was made by Captain James Cook at Adventure Bay, Bruny Island (just off what is now Tasmania) in 1777. This was part of his policy of introducing animals and plants to newly discovered countries (Thanks, Jim!). 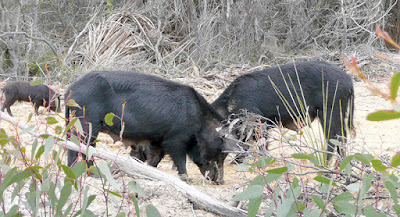 However today's problems with feral pigs really started when domestic pigs (Sus scrofa) were first introduced into Australia by the First Fleet in May 1788. Then 49 pigs were brought to Sydney as a food source and were subsequently allowed to roam. By the 1880s they had run wild in New South Wales. They now have declared pest status country wide. Agriculturally they reduce crop yields by consuming or trampling plants. Fences and water sources can be damaged. Dams and waterholes are fouled through wallowing and defecation. They also compete with livestock for pasture and damage pasture by up-rooting vegetation. Environmentally they disturb natural habitats by rooting up soils, grasslands and forest litter and consuming a range of native plants. They also eat a range of live native animals including earthworms, beetles, centipedes, amphipods, snails, frogs, lizards, snakes, turtles and their eggs and small ground-nesting birds and their eggs. Feral pigs can be hosts or vectors of a number of endemic parasites and diseases, some of which can affect other animals or people eg. leptospirosis. Control methods include aerial and ground shooting as well as trapping and strategic poisoning. Deer were introduced into Australia from Europe in the 19th century as game animals. There are now six species in various parts of the country: fallow, red, chital, hog, rusa and sambar. They are a major emerging pest problem, causing damage both to the natural environment and agricultural businesses. 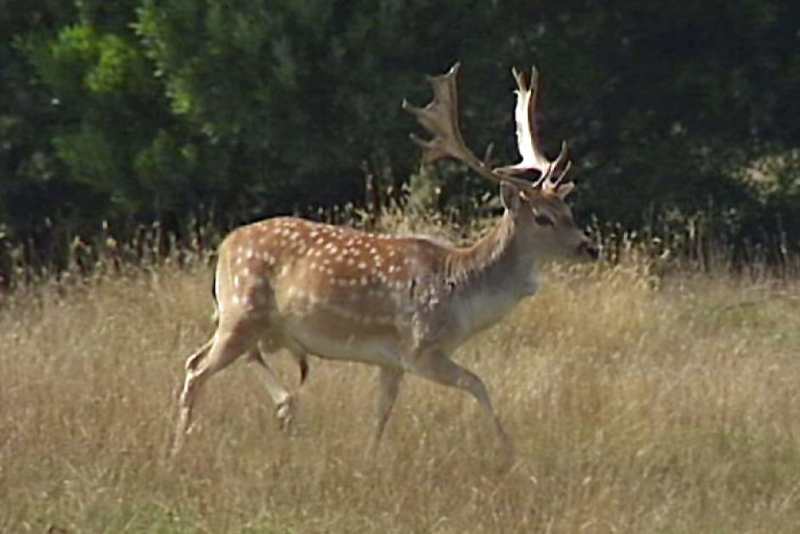 Populations are expanding and deer are invading new areas. They destroy native vegetation by trampling plants, grazing, and ring-barking young trees, fouling waterholes, causing soil erosion, spreading weeds and potentially transmitting diseases. The most common control measure is shooting by recreational hunters and sometimes by professional marksmen. 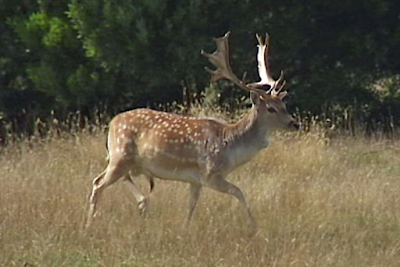 Another control approach is prevention of the escape of farmed deer so that they do not create new wild populations or bolster existing wild populations. 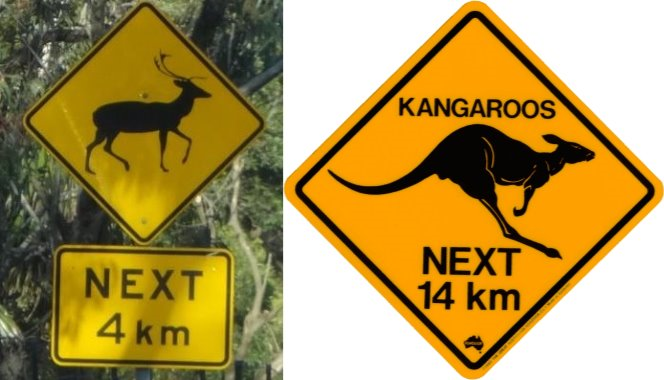 We do not have a problem with them around here but they are in plague proportions in the Royal National Park on Sydney's southern outskirts. 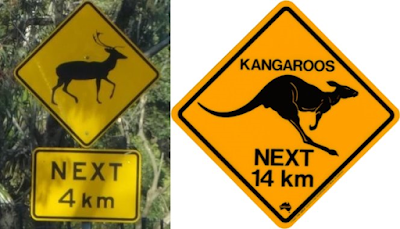 It's a bit strange for us to see road signs warning about deer rather than kangaroos. The first horses, around seven of them, arrived in Australia with the first British colonists, in January 1788. They became essential to the development of the nation’s pastoral, farming, mining and timber-getting industries and for decades were the main means for moving goods, supplies, mail and passengers between towns and around cities. Today, horses have been replaced by technology but thousands of Australians continue to share deep connections with their animals, from outback stockmen, to racing, pony clubs and weekend riders. In the meantime many horses have gone wild. In the more environmentally sensitive places like the Alpine regions eg. the so called 'high country' of Victoria and New South Wales much of which is national park, they are causing damage. Authorities are calling for their removal wanting the elimination of 90 per cent of the estimated 6000 wild horses over 20 years in the Kosciusko National Park alone. Aerial and land culling were suggested as the preferred options. The brumby is ingrained in our culture. Many think they should be valued for the historical links to early settlers and popular legends such as The Man From Snowy River and military roles such as the Light Horse Brigade. Others think it is more important to stop the degradation of the wetlands in the Australian Alps and protect critically endangered species such as the corroboree frog, alpine water skink, and the broad-toothed rat.